After 4 years of reserach and coordination with data from the FFA Museum in Switzerland, IRMA is finally ready to release our long-awaited kit of the FFA P-16! 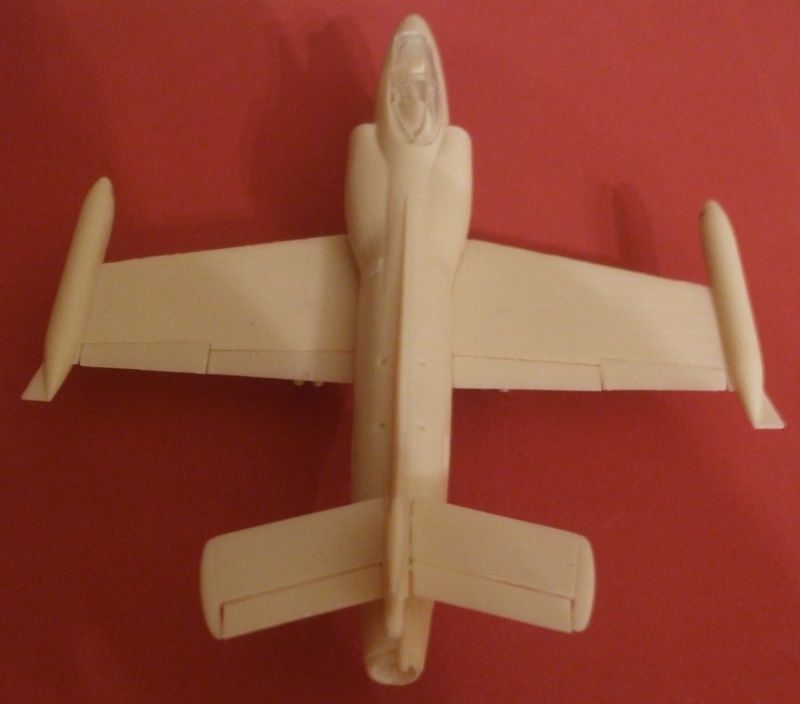 As you can see from the photo of the kit, we've included the Krueger Flaps on the front wings as well as separate flaps and ailerons on the back. We have also included decals for all five prototype plus full ordinance. We hope you will enjoy the kit! 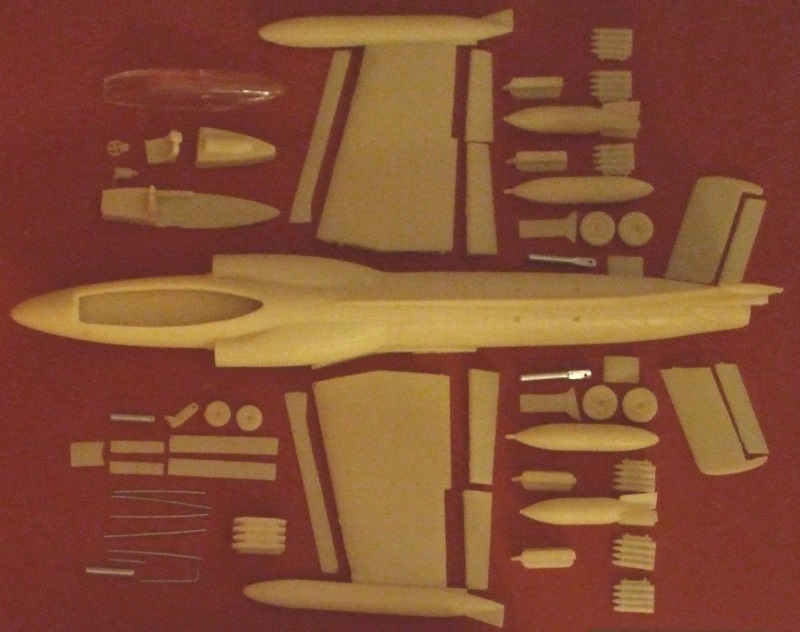 This model of the FFA P-16 contains parts to make any of the five prototypes. To make prototype #1 some modifications will be required, however, we'll cover that in the building portion. 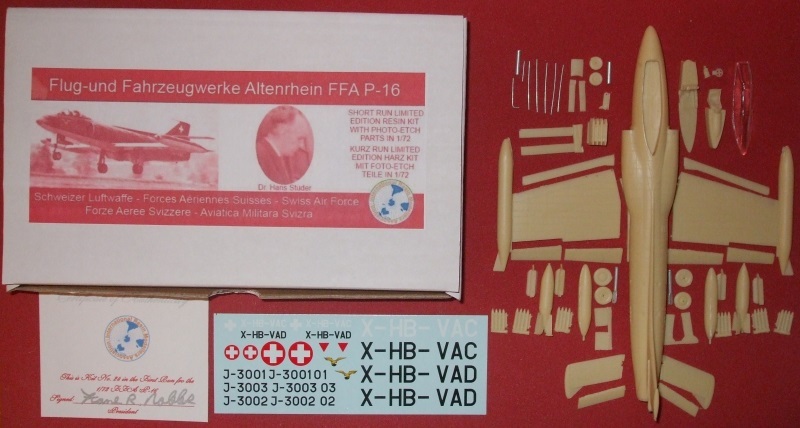 For now the contents of the box include a short history of the FFA P-16, a Parts List, Assembley Instructions, Paint Guide, Certificate of Authenticity, decals and kit parts. Prebuild preparation. Wash parts in soft detergent bath to remove any resin release residue. Clear resin parts will come out cloudy at first. Let them dry overnight and they should be clear by morning. Parts after cleanup (sanding, filing, filling and cutting). Once parts are prepared test fit each one before assembly and gluing. Use gel initially as this gives more time to position parts. When in place a drop of liquid glue can be added to hold parts firmly in place. Before commencing to build, decide if you want the flaps up or down, including the Krueger flaps at the front of the wings. If your bird is going to be sitting on the tarmac then the flaps can be down or up. If landing, then all will be down. We’ve made both options available. 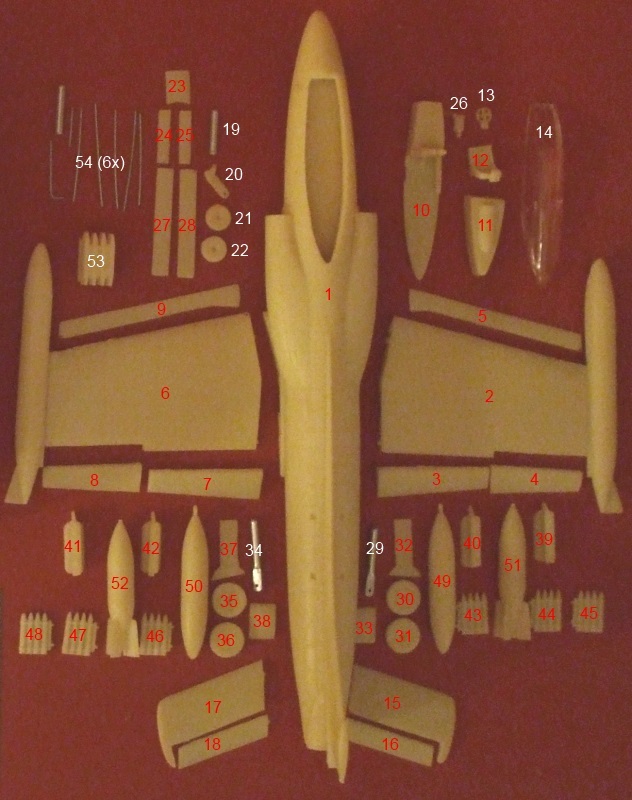 For building, start with the fuselage (part 1) glue and insert the cockpit floor (part 10) and follow with the cockpit instrument pack (part 11). Insert pilots seat (part 12) control wheel (part 13) and cockpit control levers (part 26) on the starboard side of the fuselage. Next glue starboard wing (part 2) onto fuselage (part 1) making sure it is aligned correctly. 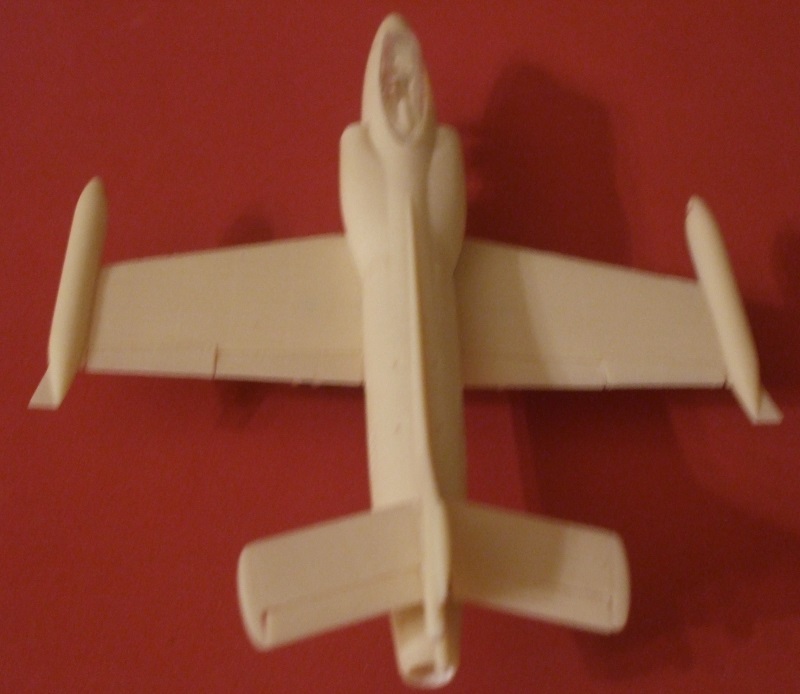 Once dried, decide how you want to position the flaps and ailerons. Then glue starboard aileron (part 4) and starboard flap (part 3) onto wing. Now glue starboard Krueger flap (part 5) onto the front of the wing. 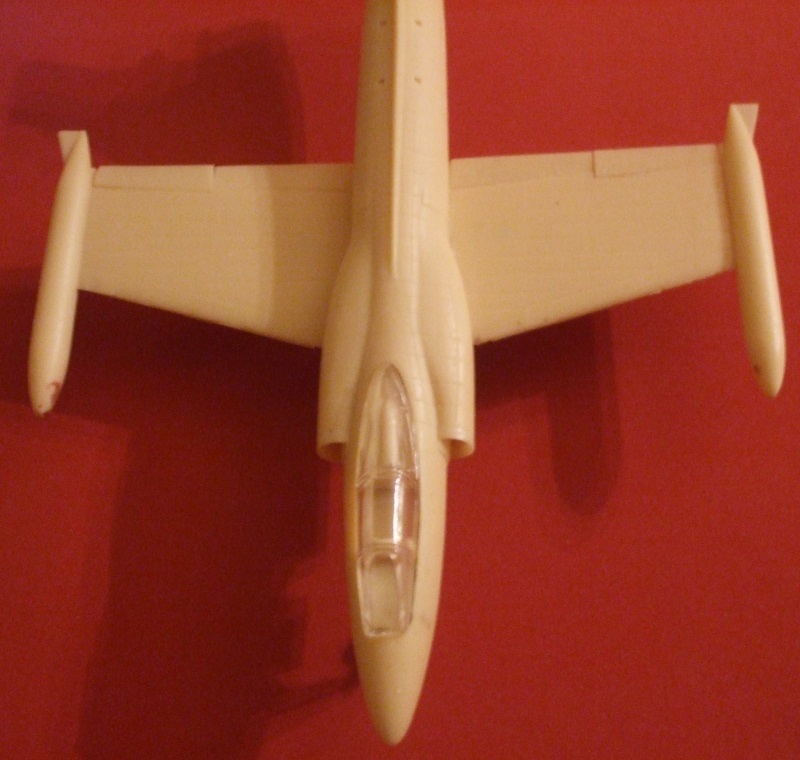 Now glue the port wing (part 6) onto the fuselage followed by the port aileron (part 8) and starboard flap (part 7) followed by the port Kruger flap (part 9). 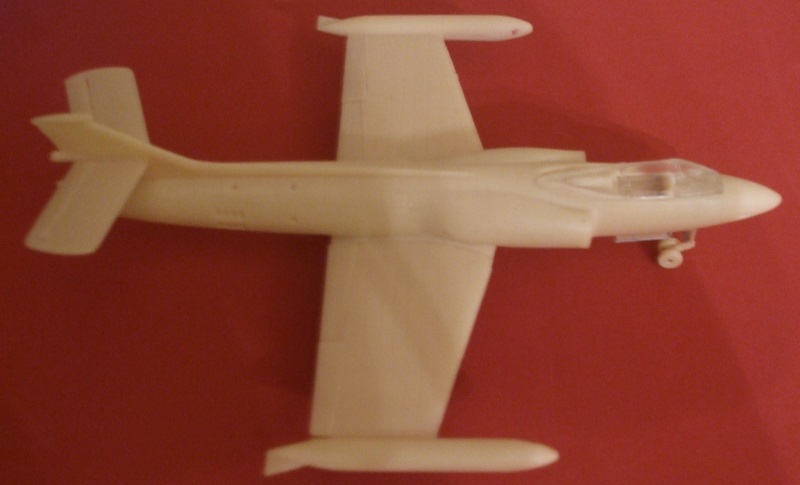 Moving onto the tail, already a part of the fuselage (part 1) attach the starboard tail plane (part 15) and position horizontally then glue starboard elevator (part 16). Next fasten the port tail plane (part 17) and port elevator (part 18). For the landing gear glue starboard main landing gear leg (part 29) to starboard wing (part 2) followed by the port main landing gear leg (part 34) to the port wing (part 6). 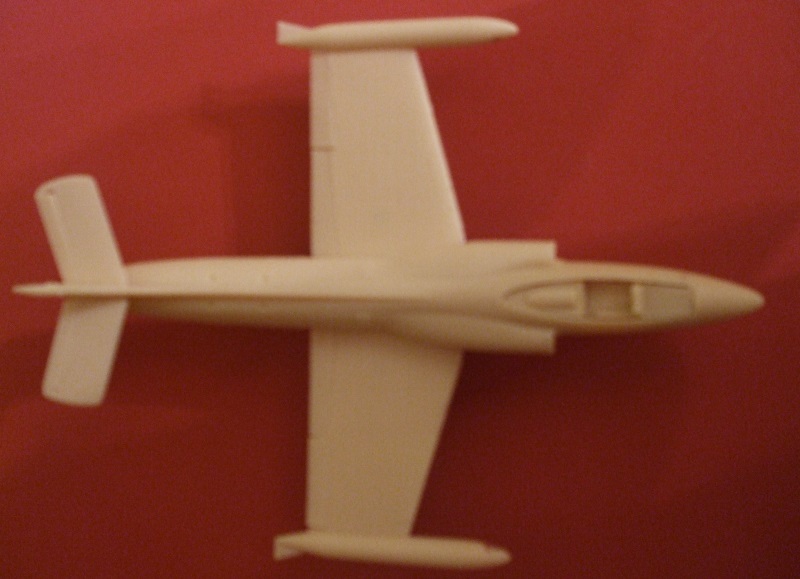 Then attach front landing gear leg (part 19) to fuselage (part 1) followed by nose wheel support (20). For the landing gear doors, on the starboard side glue starboard inner landing gear door (part 32) to fuselage (part 1) followed by the port inner landing gear door (part 38). Glue starboard outer landing gear door (part 33) to starboard landing gear leg and port outer landing gear door (part 37) to port landing gear leg. Leave enough space for wheels later. For the nose, attack starboard landing gear door (part 24) and port landing gear door (part 25) to fuselage (part 1) followed by nose landing gear door (part 23) to front landing gear leg. Again leave enough room for wheels. Now attach starboard weapons bay door (part 27) and port weapons bay door (part 28) to weapons bay on underside of fuselage (part 1). For the wheels, these can be stationary or movable depending on your desires. To attach wheels to landing gear legs cut the appropriate length of wire (part 54) to ensure both wheels are covered. 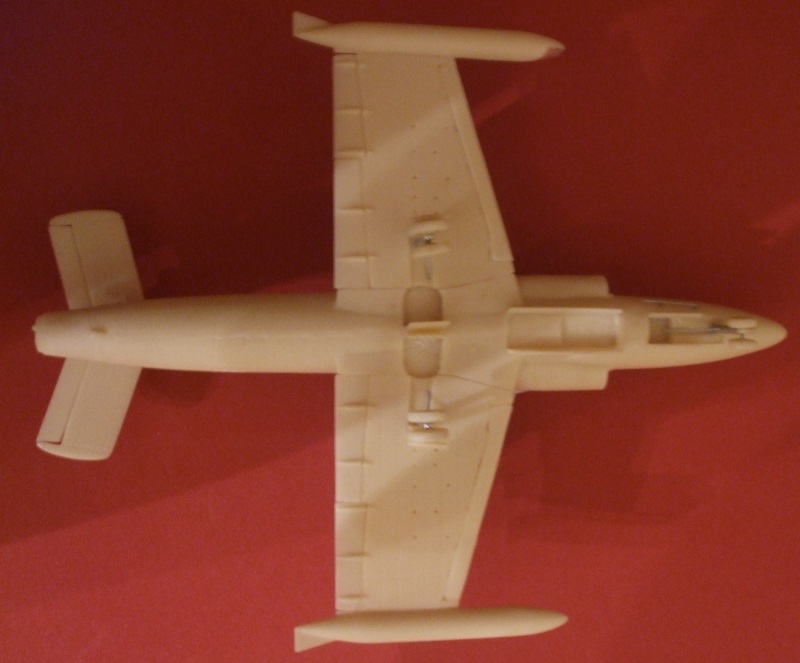 Beginning with the front landing gear, fasten starboard wheel (part 21) to wire and insert through landing gear support (part 20) fastening port wheel (part 22) to other side of wire. On the starboard side, attach wire (part 54) to starboard main landing gear wheel (part 30) and insert through landing gear leg (part 29) fastening port starboard wheel to the other side. Repeat for port side by fastening port starboard wheel (part 35) to wire (part 54) and passing through port landing gear leg (part 34) and attaching port side port wheel (part 36). At this point it must be decided how much ordinance is desired for your bird. Here we will assume full ordinance. For the starboard side attach starboard outer weapons pylon (part 39) and starboard inner weapons pylon (part 40) to starboard wing (part 2) followed by the port outer weapons pylon (part 41) and port inner weapons pylon (part 42) to the port wing. Attach starboard auxiliary fuel tank (part 49) to starboard inner weapons pylon (part 40) and port auxiliary tank (part 50) to port inner weapons pylon (part 42). Next attach starboard bomb (part 51) to starboard outer weapons pylon (part 39) and port bomb (part 52) to port outer weapons pylon (part 41). For missiles, attach starboard missile pack 1 (part 43) and starboard missile pack 2 (part 44) between starboard landing gear and auxiliary tank (part 49) and starboard missile pack 3 (part 45) between auxiliary tank (part 49) and starboard bomb (part 51). On the port side attach port missile pack 1 (part 46) and port missile pack 2 (part 47) between port landing gear and port auxiliary tank (part 50). Then attach port missile pack 3 (part 48) between auxiliary tank (part 50) and port bomb (part 52). 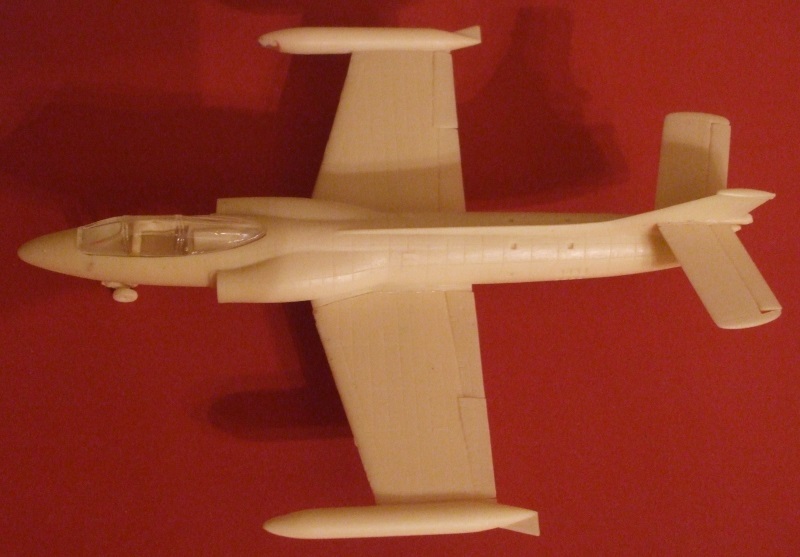 Attach fuselage missile pack (part 54) to front of weapons bay on fuselage (part 1). 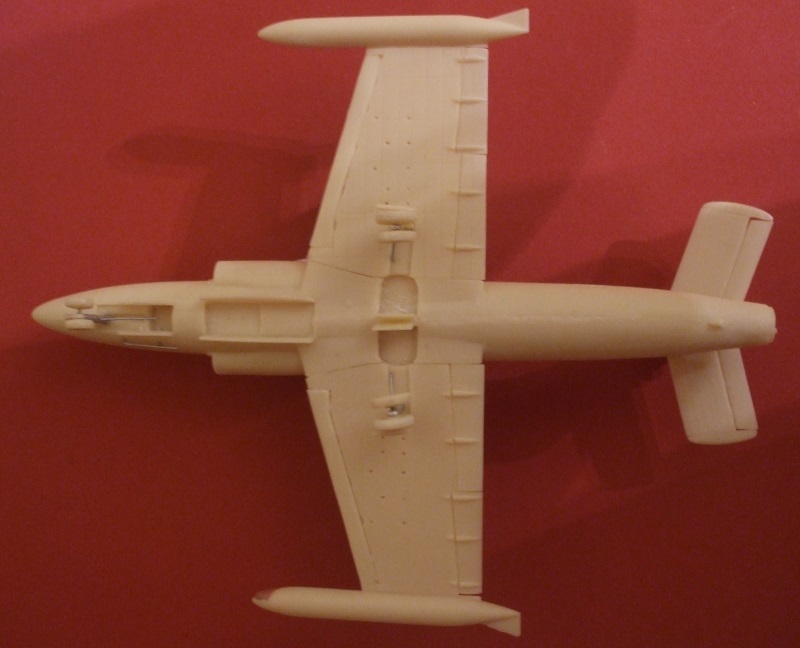 If desired, parts 54 can be used to create additional details such as pitot tubes on the tail fin, nose or port outer wing tank. Also as tubing on the port side of the fuselage. Attach cockpit canopy (part 14) last after interior and exterior painting is complete and a pilot figure is inserted, if desired. 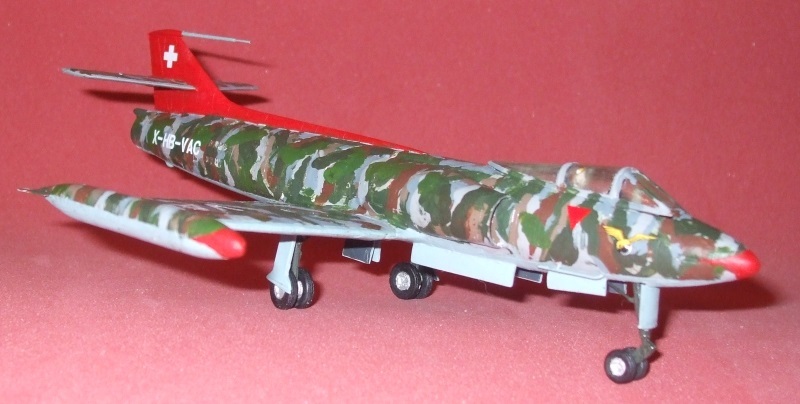 With the prototypes for the FFA P-16, the first three were silver overall with J3001 all silver, J3002 with blue flash lines and J3003 having red flash lines and a red tail fin. 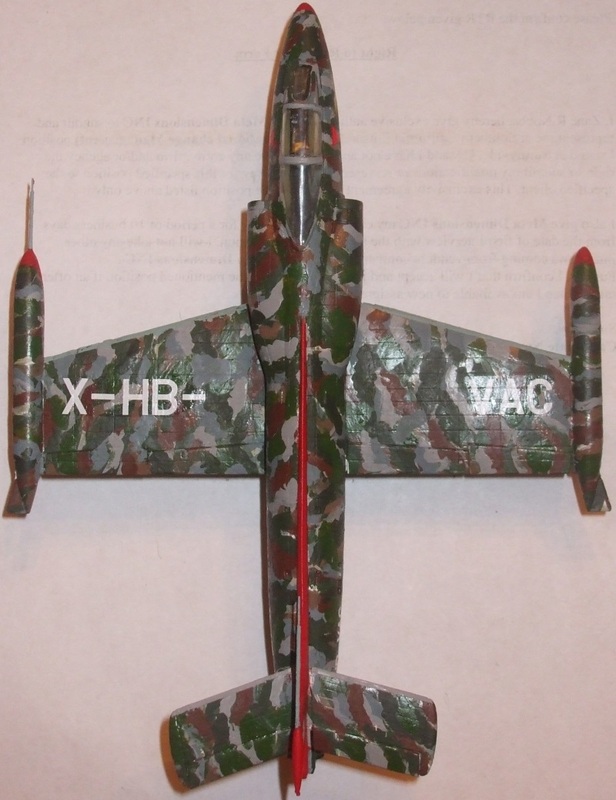 Prototype number 4, X-HB-VAC, was put in camouflage with a red tail while prototype 5 X-HB-VAD, reverted back to overall silver with red flash lines. Should you desire to add a pilot, the Swiss pilots wore uniforms of Khaki brown, white helmet, black shoes and gloves. 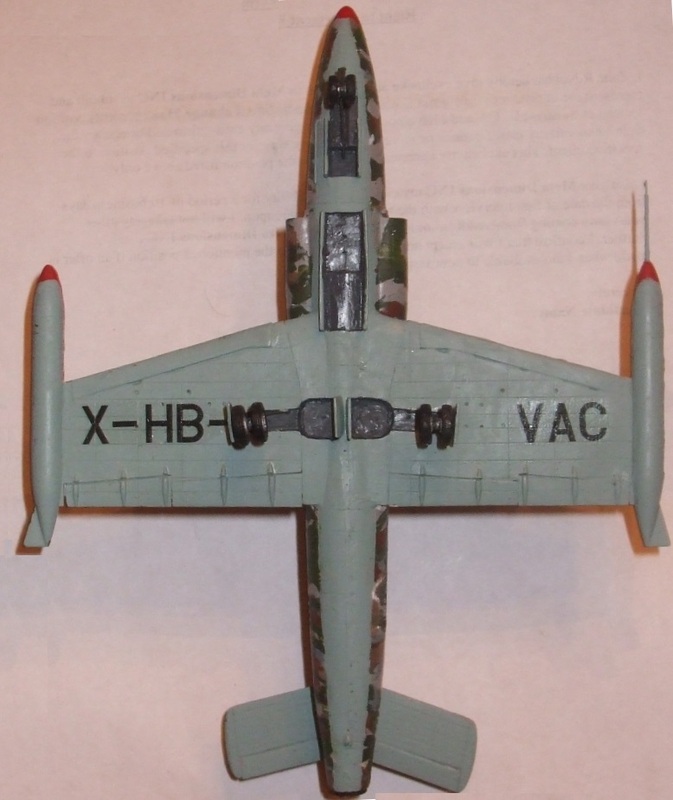 Internal areas are generally bare metal for landing gear bays, except for prototype 4, X-HB-VAC, which were the same color as the underside (a light, pale blue-green). 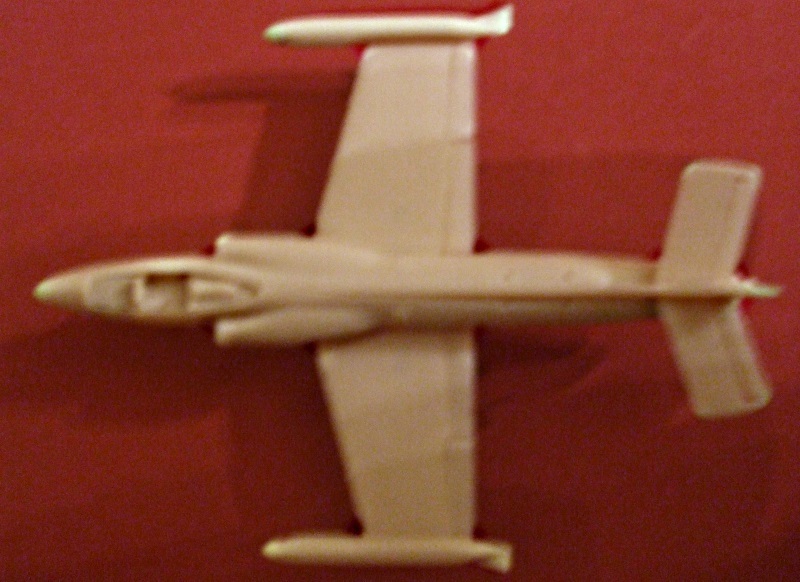 Cockpit was interior green while missiles were light gray with yellow rings near the tips. Auxiliary tanks were the same color as the aircraft and bombs were olive green with yellow tips. Place small white-on-red crosses on either side of the tail fin, large white-on-red crosses go on underside of wings only. Prototypes J3001, J3002 and J3003 had bare wing tops while prototypes X-HB-VAC and X-HB-VAD displayed their call letters on the top side of the wings. Two digit numerals went on the front landing gear doors. These were the last two numerals for prototypes 1, 2 and 3 and were 01, 02 and 03 respectively. Red triangles were placed on either side of the cockpit since these were emergency release instructions. For prototype 4, X-HB-VAC, the eagle decal was on the port side only, however, we have provided one for each side for your discretion. Colors used in camouflage include: sky grey, medium grey, olive drab, olive green, flat green, NATO brown, flat earth and flat white. 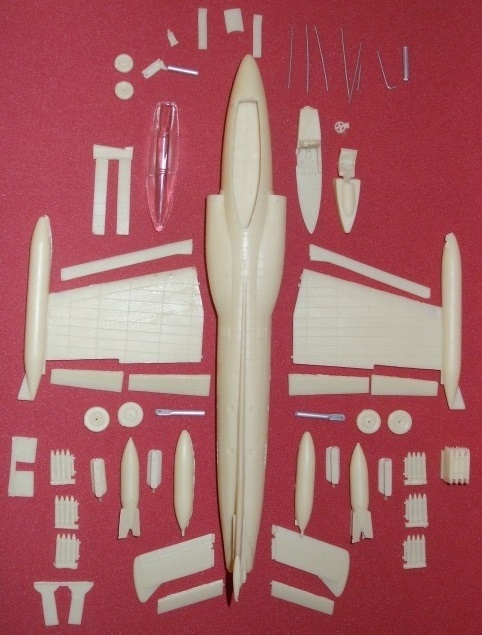 The underside is sky blue and nose, tank tips and fin are flat red. Cockpit and wheel wells are dark grey.